at: academia.edu/ and http://vixra.org/abs/1504.0165 . Climate science's fundamental premise – assumed by all parties in the great climate debate – says the greenhouse gases – constituting less than 2% of Earth’s atmosphere, first derived by John Tyndall‘s in his 1859 thermopile experiment, and demonstrated graphically today by infrared spectroscopy – are special because of their IR (heat) absorbing property. From this, it is – paradoxically – assumed the (remaining 98%) non-greenhouse gases N2 nitrogen and O2 oxygen are non-heat absorbent. This paper reveals, by elementary physics, the (deceptive) role thermopiles play in this paradox. It was found: for a special group substances – all sharing (at least one) electric dipole moment – i.e. CO2, and the other greenhouse gases – thermopiles – via the thermoelectric (Seebeck) effect – generate electricity from their radiated IR. Devices using the thermopile as a detector (e.g. IR spectrographs) discriminate, and have misinterpreted IR absorption for anomalies of electricity production – between the sample gases and a control heat source. N2 and O2 were found to have (as all substances) predicted vibrational modes (derived by the Schrodinger quantum equation) at 1556cm-1 and 2330cm-1 respectively – well within the IR range of the EM spectrum and are clearly observed – as expected – with Raman Spectroscopy – IR spectroscopy’s complement instrument. The non-greenhouse gases N2 and O2 are relegated to greenhouse gases, and Earth’s atmospheric thermoelectric spectrum was produced (formally IR spectrum), and was augmented with the Raman observations. It was concluded the said greenhouses gases are not special, but typical; and all substances have thermal absorption properties, as measured by their respective heat capacities. Why N2 and O2 are also greenhouse gases? Using Raman Spectroscopy to re-determine the 'greenhouse gases'. Raman spectroscopy (a complement to IR spectroscopy) challenges this greenhouse gas / non greenhouse gas paradigm, and reveals that this assumption and conclusion, based on IR spectroscopy measurements, to be false or incomplete. It can be shown that N2 and O2 absorption bands are by their nature - due to their symmetric vibration - totally transparent to all IR detectors, but are not transparent to Raman detectors and show an 'absorption' band in the mid infrared. Ramon Spectroscopy shows: CO2 and the other greenhouse gases to be typical and not special as are N2 and O2 . N2 and O2 are 'greenhouse gases'. If this premise is refuted, the question is: what are the greenhouse gases, and what is the greenhouse effect? In an earlier entry I cataloged where CO2's heat trapping property should but doesn’t repeat. Having found that CO2 doesn’t repeat (at least at any significant level so as to be measurable or notable) I set out, to explain why CO2's heat trapping doesn’t repeat? : why is it that we think it does? My conclusion is very disturbing: the foundation argument or premise of 'heat trapping, climate changing, CO2 does not appear to be consistent with the related fundamental laws and textbook knowledge of physics, and Raman spectroscopy has been completely overlooked. I have found all of the foundation arguments can be (easily) challenged, just by studying these laws in detail. Inspired by the work of Galileo, I am calling this entry ‘The Gassy Messenger’: I also thought of calling it after the mysterious dark energy and dark matter ‘the dark climate', and its 'dark gases’. Modern climate science's fundamental premise - by all parties in the great climate debate - is that the greenhouse gases (around 2% of the atmosphere) absorb radiant infrared (IR) heat (as derived by IR spectroscopy), and are (to some proponents) a main climate driver because of this special property. This premise has its origins with the John Tyndall 1859 thermopile infrared gas analysis experiment. The (remaining) non-greenhouse gases (N2 nitrogen and O2 oxygen) are distinguished from the greenhouse gases by their inferred inability to absorb (infrared) heat - deduced from the same experiment. Modern practical application of Tyndall's apparatus , the thermopile, suggest he (and many scientists today) confused absorption with opacity - a property of light. Fig.4. 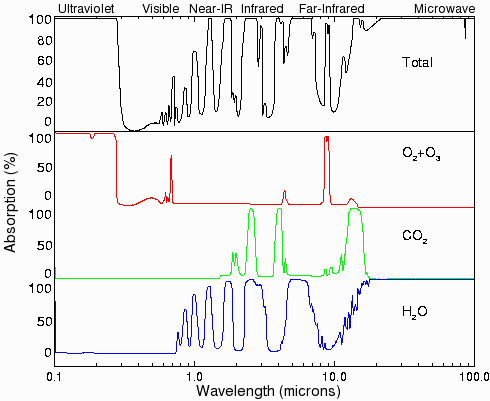 Absorption of ultraviolet, visible, and infrared radiation by various gases in the atmosphere. Most of the ultraviolet light (below 0.3 microns) is absorbed by ozone (O3) and oxygen (O2). Carbon dioxide has three large absorption bands in the infrared region at about 2.7, 4.3, and 15 microns. Water has several absorption bands in the infrared, and even has some absorption well into the microwave region. There is already sufficient CO2 in the atmosphere to absorb almost all of the radiation from the sun or from the surface of the earth in the principal CO2 absorption bands. (Data from ref. , page 93; original data are from Howard et al  and Goody ). The definition addresses why N2 and O2 are not greenhouse gases, and the figure shows that it's not. Definitions and images like these are together the basis of the global warming conjecture. N2 and O2 have no dipole, so they are not greenhouse gases. Yes, N2 and O2 are both transparent to IR spectroscopy, but this fact still begs the question: how can the atmosphere be warm, if 98% of it (N2 and O2) are not IR (heat) ‘absorbent'? How can N2 and O2 be non greenhouse gas, yet they have a heat capacity coefficient? Something must be wrong with this conjecture. I have found that there is. In a complementary entry to this one 'IR detectors are deceptive in wrong hands' I learnt - just as the title says - that IR camera's and the like are deceptive to the unwary, and have found to solve this paradox an alternative measuring instrument or method other than IR spectroscopy must be sourced to reveal the true IR properties of N2 and O2 (and all other gases). Such an instrument does exist, Raman spectroscopy. In this (following) entry I shall: show - using both primary and secondary publications - that Raman Spectroscopy reveals the (total) atmosphere is made up of (only) greenhouse gases – i.e. that oxygen and nitrogen are also heat absorbent. I will show that CO2 is thermally typical, and not at all special. As shown in the above video clip CO2 has a predicted IR band that only shows with Raman Spectroscopy. This is supported by the following images/references. In the first the symmetric stretch at 1537 cm-1 is predicted 'B', and in the following image below, a 'cartoon' image clearly showing bands A, C and D of the IR (spectroscopy) spectrum, and in the lower cut, the 'green' Raman showing the band B. Please read my update below after reading this section. To confirm my hypothesis that N2 and O2 do have an absorption band, either a primary experiment with a sample of the atmosphere should be conducted - using a Raman spectrograph machine, measuring for an N2 and O2 response in the IR region of the EM spectrum - or secondary research conducted, searching for research done on the atmosphere by means of Raman spectcoscopy. In the absence of an experiment, secondary results were searched using a google image search with the key words Raman spectcoscopy atmosphere. A positive image ('Fig. 11' below) was quickly found. This figure and its caption clearly comes from an unrelated journal publication, but the image reveals what many others in the same search reveal - such as: Heat Treating: Proceedings of the 16th Conference.Jon L. Dossett, Robert E. Luetje, 1996 page 228.
Notable are the O2 and N2 peaks at wavenumber 1556cm-1 and 2331cm-1 respectively. These wavenumbers correspond (after conversion) to wavelengths 6.43 microns and 4.29 microns respectively - which are in the mid infrared region of the eletromagnetic specturm. The image below (Fig. 18) shows again the 1556 O2, and other peaks at higher wavelengths along the spectrum. From these images it can be concluded that N2 and O2 (and other gases) are infrared absorbent at the said wavelengths, and so are too greenhouse gases. 3 . Are the stretching modes of the diatomic molecules O2 and N2 infrared active? Why or why not? Are the stretching modes of O2 and N2 Raman active? Why or why not? The stretching mode of a homonuclear diatomic molecule does not lead to a change in the dipole moment of the molecule; hence, the stretching mode is not IR active. Both N2 and O2 are symmetrical by nature, and so will never show up in IR spectroscopy but it will in Raman, as by a law of physics; unlike other molecules such as CO2 - which are both symmetrical and anti-symmetrical. 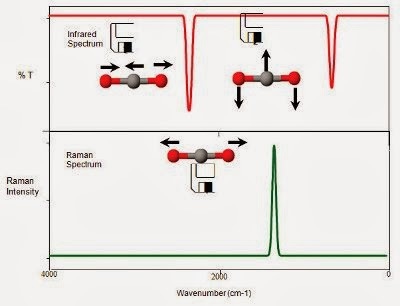 If Raman spectroscopy was the only test we had to analyse the IR spectrum of substances, we could have equally have concluded that N2 and O2 are the (only) greenhouse gases. If this Raman spectroscopy discovery is found true, by experiment, then the 2% (volume) of said greenhouse gases should be revised and relegated to 100%, by adding N2 and O2 (and others if so). Any assumptions by any climate models,or climate knowledge, or claims that the atmosphere consists of around 2 % (volume) special greenhouse gases will need reviewed – as said above. I have been reviewing my observation and have since learnt that (and if I am not mistaken) a ’Raman shift wavenumber is not the same as an wavenumber, and so I may have got ahead of myself with my conclusion that the N2 Raman shift of 2331cm-1 (as shown in the figures below). In the name of science I took down my entry, I do not aim to mislead. The shift actually corresponds ( after a correction to do with the excitation frequency of the laser) to a wavelength of 263nm, nowhere near the thought 4 microns (in the mid infrared). I have also learnt that Raman cannot penetrate the mid and far IR. I would like to know if this is true? There must be a Raman absorption band for O2 and N2 in the IR range of the spectrum somewhere, otherwise, why do O2 and N2 have a specific heat capacity? Why is Raman spectoscopy totally ignored when deriving the GHGs, when N2 and O2 are Raman active, and the likes of CO2, CH4 and H2O are too? Why is it thought that IR spectroscopy is the complete picture, when it is clearly discriminants out (by the exclusion principle) symmetric vibrational and rotational modes? With a knowledge of Raman and IR spectroscopy, and the properties of light, and of substances, it is clear that the GHG’s and its GH theory are derived by cherry-picking only one side of the knowledge. To add to this, I have learnt (and have many references to the fact) that the degrees of freedom and vibrational movements of molecules are secondary and accentually a smoke screen, to the real elephant, the Specific Heat Capacity (SHC) of a substance. The SHC of a substance is derived from the degrees of freedom/ vibrational movements of a molecule. On the grounds of the SHC, CO2(0.8 no units) is nothing special relative H2O vapour (2 ): but this property again opens another cherry picking opportunity - as substances with low SHC’s heat faster when energized, than that those with higher, when in isolation. Regarding heat capacity: consider that not all heat transfer is radiative. Sure, but I've learnt more since this. All matter must radiate, if not it contradicts thermodynamics and quantum mechanics. Also 'air' is a very poor conductor. Air, N2 O2 must radiate, and I have found it actually does, in the thermosphere where there is only radiation. Molecules of N2 and O2 are excited by the sun and 'heat up' - to temperatures (energies) of 2000 to 2500C. Good for the goose, good for the gander.